Flickering spinners of "Fishmagnet-2" of average brightness have the oblong form imitating the grown-up whitebait. Mode of flicker of a bait is rather "soft". Flash out of a LED alternate with continuous pauses. A game of a spinner, low intensity, is similar to movements of a sick small fish. The bait is suitable also for a trolling tackle. Set before a wobbler or a spinner, it imitates the escaping extraction. Flickering spinners of Fishmagnet-2 - the unique product combining the modern achievements of microelectronics with manual design. Spinners of the Fishmagnit-2 series consist of a steel plate which provides rated weight of a bait, and the plastic colored by a phosphor which gives to a spinner the form of "wing". In a bait the LED of red, yellow, orange, green, white or blue color of a glow, the controller of control and the power supply is built in. 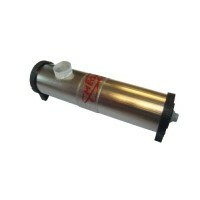 The battery of a source provides flicker of a LED about 1000 hours. On the plastic side of a spinner contacts of the switch are located. 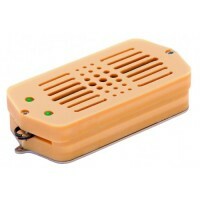 They provide automatic switching on of a LED in case of hit of a bait in water. The spinner after extraction from water is disconnected. This spinners almost doesn't consume energy and several years can be stored. The glow of a phosphor is used in a spinner as a background. For fishing in the conditions of good illuminance of a charge of a phosphor is enough approximately for an hour. When catching at night or deeply - for days. 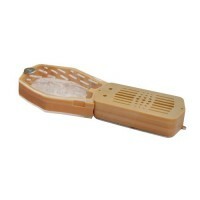 Brightness of a LED is invariable during all service life of a bait. 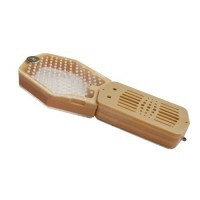 In a spinner the highly effective LED which provides brightness about 4 MCD is applied. Such brightness is enough for any conditions of illuminance, except catching in shallow water in a sunny weather. Duration of flash of a LED - about 2 sec., and a pause in between - 1-1,5 sec. 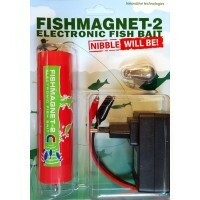 Such mode of flicker perfectly attracts fishes and other underwater inhabitants and noticeably saves a battery resource. The spinner is equipped with two clockwork rings and a fishing hook No. 8 (small spinner). 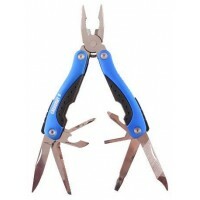 The sizes of fishing hooks gives on the international classification. Weight of the equipped spinner - 10 gr. (small spinner). Overall dimensions of spinners - 6,5 x 1,3 x 0,8 cm (small spinner). Thanks to a shape of "wing" and the displaced center of gravity of a spinner of the Fishmagnet-2 series has original "game". Amplitude and sharpness of dispersal are defined by the fisherman. Dispersal is also influenced by rigidity of a fishing rod and elasticity of a scaffold. If it is more tough, the acceleration of a spinner will be sharper. Usually length of dispersal of spinners of "Fishmagnet-2" lies within 50... 100 cm. On the picture the example with short dispersal is given on the right that comparison with other spinners was correct. The inertial trajectory depends on spinner speed at the end of dispersal. The speed - the more amplitude of a deviation of a spinner is higher. This phase of the movement practically doesn't depend on immersion depth. 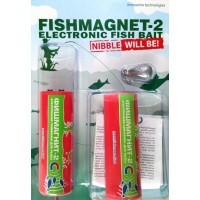 Baits of "Fishmagnet-2" can be carried to spinners of low activity. Deviation amplitude from a vertical usually makes 20... 50 cm. Return of a spinner to a starting position to a great extent are defined by depth of immersion and thickness of a scaffold. Parameters of planning of return of a spinner depend on scaffold resistance in the water environment. At small depths where there is no stabilizing influence of a scaffold, the trajectory of return is in many respects casual. Thanks to the design, at the end of dispersal the spinner always deviates towards the plane. However, it doesn't mean that the spinner will move on one trajectory as shown in the picture. In reality, the spinner comes back to a starting position slowly rotating. Therefore the direction of a trajectory of the movement of a spinner every time will be new. Except a steep descent for which these baits were developed, spinners can be used also on other tackles both on sea fishing, and in fresh-water reservoirs. 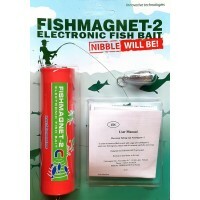 When catching on a spinning, the bait of "Fishmagnet-2" behaves as not really active fluctuating spinner. However, it well imitates subjects to hunting, habitual for a perch and a pike perch, and is very effective in the afternoon and in twilight. Trolling. 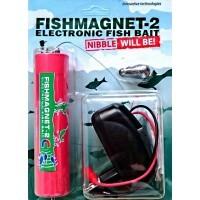 Flickering spinners of "Fishmagnet-2" can be used on a trolling tackle. Baits are insufficiently heavy for independent application therefore they are located at distance 20... 60 cm before the main spinner or a wobbler. The main baits shall be a larger size. Then the effect of a pursuit of a predator of a whitebait is implemented. It is optional to remove own tee from a steep spinner as often the predator attacks it trying to take away production from the rival. Onboard and winter rods. Steep spinners can be used as a sinker on onboard and winter rods. 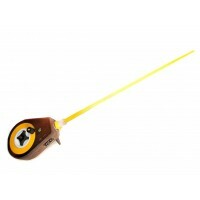 Thanks to high brightness they perfectly attract fishes to other baits from long distance. 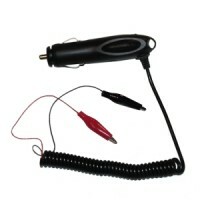 This electronic fishing spoons (spinners) are delivered from the warehouse Fishmagnet in Russia by Russian Post, EMS Russian Post or DHL express.